The apartment is located near the center of Yalta in a quiet area, near the Avangard stadium (10 minutes walk). Before the embankment go for 15 minutes or go one stop on public transport, to the center - 10 minutes or one stop to the cinema "Spartak". 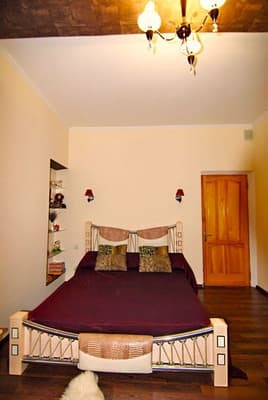 The apartments are located in a private sector with a separate entrance, equipped with everything necessary for comfortable living: a spacious bathroom, kitchen, dishes, sofa, Internet, air conditioning, washing machine, in the rooms - two double beds and one sofa bed. In the courtyard for the company's rest there is a cozy gazebo where you can fry shish kebab. To services of visitors - parking places in territory of the house. The apartment can accommodate up to 9 people. Distance to the bus station in Yalta - 3.9 km, to the city Simferopol - 72.6 km. PRICES MAY CHANGE, IT IS REQUIRED TO RECEIVE INFORMATION FROM THE OPERATOR. Description of the room: Internet, TV, air conditioning, washing machine, in the rooms - two double beds and one sofa bed. In the kitchen there is a soft corner, a gas stove, a kettle, a refrigerator, and utensils. Spacious bathroom. 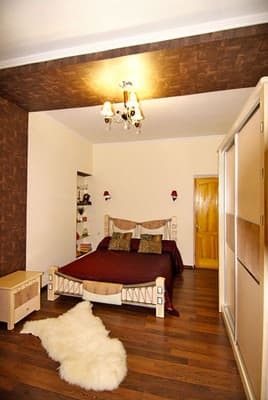 The apartment is located near the center of Yalta in a quiet area, near the Avangard stadium (10 minutes walk). Before the embankment go for 15 minutes or go one stop on public transport, to the center - 10 minutes or one stop to the cinema "Spartak". The distance to the bus station in Yalta is 3.9 km, to Simferopol - 72.6 km. Paid service by prior arrangement. From the railway station of Simferopol on any transport to Yalta. Near the railway station of the city of Simferopol (exit to McDonald's, in the direction of the tower with a clock) are auto- and trolleybus stations. From there, by regular bus, fixed-route taxi or trolleybus number 52 you can get to Yalta in 1,5-2,5 hours. By car: from Simferopol, go along the M-18 highway to the Angarsk pass, then through Alushta - on the upper intercity route (landmark, so as not to get lost in Alushta - the wires of the intercity trolley bus), then go along the upper, intercity route (M-18) along the whole The Juba is still 41 km to Yalta. In Yalta - by taxi or public transport (fixed-route taxi №17, №8, №4, №20). There is a transfer from the Yalta bus station (the service is free).